was too much for that old goat to swallow, by far. PB spends her summer on Fox Island with the other sheep and goats, but she’s more interested in stargazing than nibbling on the grass. She knows a famous astronomer once visited Toads Cove, and has set her sights on following in his path and finding a comet. Her determination irks a cantankerous old goat who plots to undermine her efforts. This playful poetic tale about a sheep who won’t give up and an old goat who learns a thing or two is inspired by the author’s community, where sheep and goats really do graze on islands off the coast, and a famous astronomer really did once visit. Award-winning artist Veselina Tomova’s illustrations offer a delightfully whimsical complement to this charming story. "[Parsons'] expertise is on full display in the lilting tone and traditional narrative feel of PB's Comet. Indeed, the imperative to read the story aloud is almost irresistible." "There is a trend in children's literature to bring STEM ideas to the forefront, and PB's Comet offers that perspective with the wonderful reassurance that boy, girl, or sheep - if you work hard and you are patient, you, too, can discover something great." "PB's Comet is funny, rhythmic and imaginative, but more than that, for lambs, girls, and those pursuing their passions, PB's Comet has an important message about self-actualization that teachers and parents would do well to share." 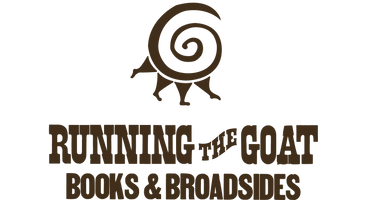 "Another delightful and quirky picture book offering from Running the Goat, Books & Broadsides, PB's story is sure to charm young listeners. The jaunty and lyrical text begs to be read aloud as it trips and dances along in frolicsome fashion. ... Veselina Tomova's illustrations are playful and sprightly, featuring a sketchy and free-flowing style and a folk-arty feel."